Fortnite challenge jump through flaming hoops requires you to find their locations, but also a shopping cart or ATK and drive them over ramps and through flames. It is a season 5 week 4 challenge that rewards 5 battlestars and is accessible to everyone. The trick is that you will have to find a Golf Kart or shopping cart first to even be able to try the jumping through flames part. In this guide we’ll try and help you find the locations of the karts closest to the ramps and then show you locations of flaming hoops you need to jump through. Here’s an important tip for you. When attempting to jump through a flame hoop with a shopping cart make sure you align it right. After you start your descend towards the jumping ramp switch seats so you are inside the cart. This will give you speed needed to make the jump. Ramps that can be used as jumping platforms were recently added to the game. They come in pairs on certain parts of the map. The first two are found in northern part of the map, in the vicinity of Lazy Links. The good thing about these ramps is that there are lots of Golf Karts in the area. Bad part is you’ll probably get to fight for them. Once you obtain the golf kart, head west from Lazy Links for the first flaming hoops location. In the small stone quarry shaped like a palm tree. This is the same location where the first week secret roadtrip battlestar is found. At the southern part of the quarry is a jumping platform. The second one is south from Lazy Links, southeast from the first one. There is a small hill, close to a road and a nearby small house with a garage. On the area between two hill tops there are two jumping ramps, with an ice cream truck between them. The third one on our list, is on the western part of the map, in Snobby Shores. The ATKs or the Golf Karts are found on the street, or inside the garages. With a help of one, drive to southern part of the town. A bit east from the southernmost house there is a small ramp with a possible Flaming Hoop location. The fourth one is south from Shifty Shafts and the Big Chair place. The closest, rare spawn of ATK is in Flush Factory. In this case it is wiser to land on the big hill just north from Flush Factory. On top of this hill, there is a small toilet shrine, with couple of shopping carts. Use them to slide down the hill, following a dirt path, where at the end of it, just next to a main road, you’ll get to jump through a flaming hoop. For the next two go to the newly added Fortnite desert area. The flaming hoop jumping platform is at the edge of a map, east of Paradise Palms. There are two possible ATK spawn spots, just above the small ravine. One near a wrecked shack, and another on a truck. Following the edge of a map, you won’t have any problems finding the jumping ramp that takes you toward your imminent death. Luckily there is a rift location underneath it, that you can use to save yourself. The sixth flaming hoop jumping platform is on the northwestern desert exit. It is just south from a small, wrecked, bridge northwest from Paradise Palms. There are no ATKs or shopping carts in vicinity, so you’ll need to use the ones from Paradise Palms or the racing track. 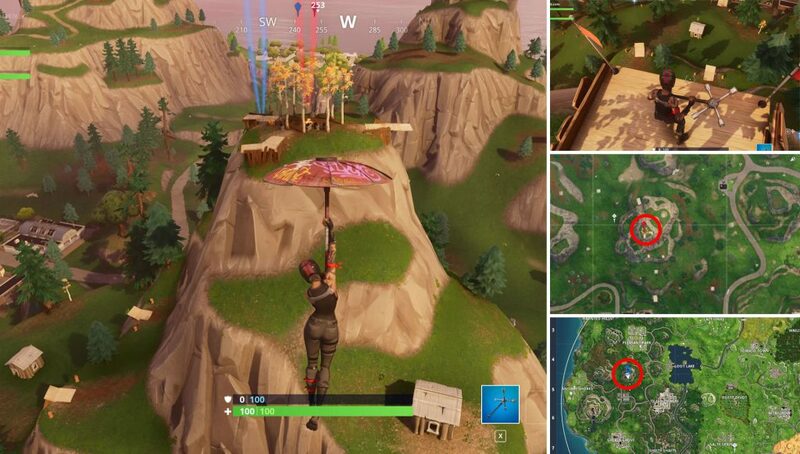 The bonus flaming hoop location, and possible the most fun one, is found on top of a tall stunt mountain, positioned just south from Pleasant Park. On top of it, there are couple of shopping carts, and three ramps, with three equivalent ramps down bellow. To succeed with the jump, once you gain speed with the shopping cart and align yourself properly, switch seats. This way, in the moment of, basically, falling downhill, you’ll find yourself inside the cart and have speed for the jump.